This page provides a brief introduction to the Highland Games in Scotland. 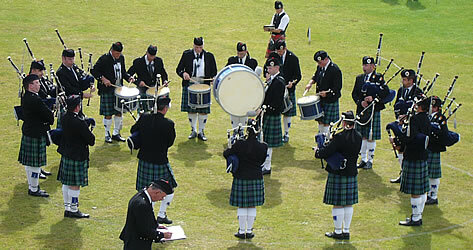 These take place in many different locations across the Highlands and Islands at weekends from mid-May to mid-September each year. 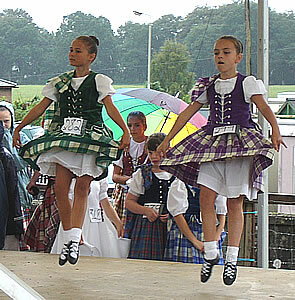 Highland dancing is the Scottish national dance and is taught in many local schools. The most famous of the dances are the Sword Dance and the Highland Fling. The bagpipe is an ancient instrument that has been played in many parts of the world. It lost popularity when most music started to be played indoors on new, quieter instruments, but it remained in use among Scotland's clans. After the unsuccessful Jacobite rising in 1745 (led by Bonnie Prince Charlie), the English banned the playing of the bagpipe because it was considered to be an instrument of war. However, many Scottish regiments were recruited into the British army, and soon the pipes and drums became an established form of military band which was heard throughout the British Empire. The Great Highland Bagpipe is the instrument that is played most frequently in Scotland. There is a bag (made of sheepskin or cowhide) which can be inflated using a blowpipe. A valve is used to prevent air from escaping back. The bag is then squeezed under one arm to force the air through a chanter (the part which produces the melody) and three drones (which each produce different background notes). At the Highland Games there are two main types of competitions for playing the bagpipes: one for solo piping and another for pipe bands. Tossing the caber is one of the most famous events at the Highland Games and involves throwing a long tree trunk. 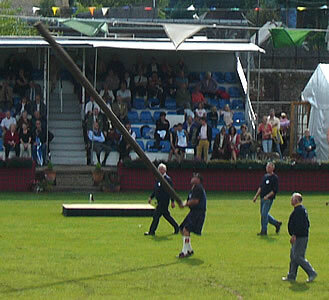 One end is thicker than the other: the caber is held by the narrower end. 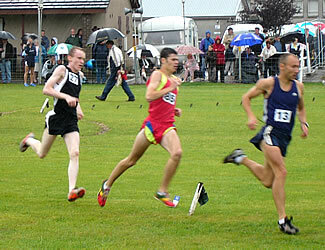 The competitor runs forward to gather speed and then uses all of his strength to push it up into the air. When the thicker end hits the ground the thinner end is supposed to rotate around it and fall on the other side, ideally pointing in exactly the opposite direction to the thrower. It is not important how far the caber is thrown. Another heavyweight sport is throwing the hammer. Originally a blacksmith's wooden sledgehammer would have been thrown, but these days this has been replaced by a metal ball on a chain. Throwers put resin on their hands to improve their grip, rotate the ball around their bodies to build up momentum, then release it at the right time. The aim is to throw the object as far as possible. Putting the shot involves holding a heavy round object (originally a stone, but now a metal ball) in front of the shoulder, taking a short run and then throwing it as far as possible. Another type of contest involves throwing the weight for height: a metal box with a ring handle (weighing 56lb, or about 25kg) is thrown over a bar which is supported on two posts. As in high jump competitions, competitors can make three attempts, and the height of the bar is steadily increased until there is a single winner. Throwing the weight for distance involves holding a 28lb (12.5kg) ball with a chain, spinning around before throwing it as far as possible. 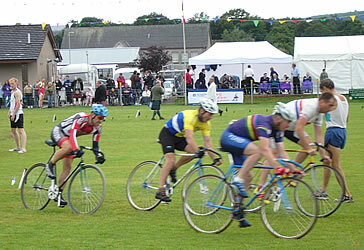 Track events include running, cycling, jumping and tug-o-war. 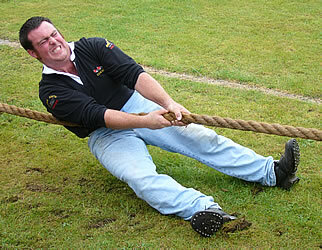 In tug-o-war ("tug of war") two teams pull opposite ends of a rope. 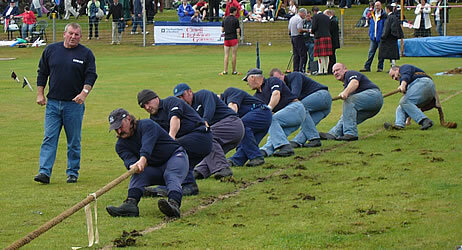 The centre of the rope is marked, and the winning team is the one that manages to pull this beyond a fixed marker.